Committed to providing great service and dependability, all for an affordable price. We offer an easy access & a convenient location just west of the Hathaway Bridge in Panama City Beach - just turn at the dolphin! 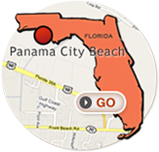 Ed's Sheds Mini Self-Storage facility is located on Panama City Beach Parkway and is locally owned and operated. We offer Clean, Convenient, Easily Accessible and Secure Storage Units. We are able to assist our customers not only with their storage needs, but with anything else they may need to make their move a more pleasant experience. Dedicated to giving our customers the best in service, we will work with our customers to match their individual needs with the correct unit size and type. Our resident on-site manager has over 11 years experience in the storage industry. This experience and knowledge helps to assist our customers in making their storage decisions. Familiar with all our sizes our manager is able to match the customer's needs. We try to make the storage experience as easy /economic and stress free as possible. Our self storage facility has video surveillance system. Our video surveillance cameras record chronological visual history of all individuals who have entered and exited the facility. Call for info if you will need to have deliveries. Our resident Manager would be happy to assist you. Deliveries can be delivered right to your storage unit. 18 Wheeler easy acccess! Big wide circular driveways for easy turn around.